Most catalogers have used the term customer lifetime value, but few of them have actually calculated it, or used it in determining their marketing strategy. Here at DoubleClick our staff has computed customer lifetime value for a number of clients, including catalogers. The results may be helpful for those in the catalog community who want to do the same thing. LTV provides a very useful measurement that can tell you whether your marketing program is going in the right direction. In this article, I will explain how we go about these projects, and what you can do with the results. To compute lifetime value you need a customer database which contains both transactions and promotion history from the catalog, the web, as well as from retail if you have retail sales. Few catalogers have such databases yet. Most of them have a fulfillment system like Ecometry, which is really swell for getting orders filled and keeping track of inventory, but is no real substitute for a multi-channel database. Sitting on top of the database you need an analytical tool such as Ensemble or Brio, so that you can get immediate access to the data you need. 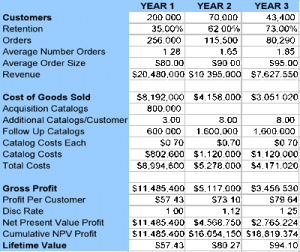 This is a simplified table because it leaves out the returns, the shipping and handling revenue and costs, and the referrals. But it gives a good picture of how we went about the exercise in the catalogs that we studied. As you can see from the top line, only about one third of the customers acquired in Year 1 come back to shop in Year 2. This figure was approximately the same in all the different segments that we studied. In Year 2 and subsequent years, the retention rate becomes much higher. Many of the disloyal customers disappear after the first year. Sixty percent of those who do return in Year 2 are still buying in Year 3. Not only are they still buying, their average order size goes up, and the number of orders per year rises. Finally, the profit per customer goes up. You can see loyalty developing right before your eyes! It took 800,000 catalogs to acquire the 200,000 Year 1 customers. Thereafter, to maintain sales the cataloger had to mail about 8 catalogs per person per year. The lifetime computation includes the discount rate. This is a simple calculation that is needed to compute the Net Present Value of profits that you are going to receive in the future. The formula is D = (1+ i*2)n where i = the market rate of interest, and n = the number of years you have to wait. If the market rate of interest is 6% then the discount rate in year 3 (2 years to wait) is 1.25. 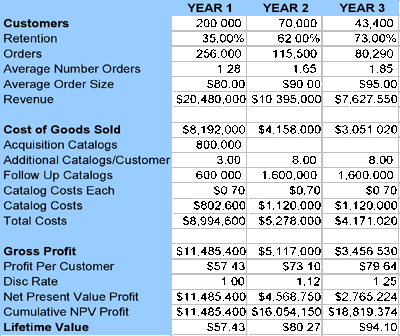 On the last line the lifetime value is calculated by dividing the cumulative net present value of the profits in each year by the original number of Year 1 customers (200,000). By itself, the figure $95.36 — the LTV in Year 3 — does not tell you very much. What makes this number useful is to compare it to the same number derived from customers in various segments. This is where the real payoff comes in. In our work with catalogs we go ahead and calculate many other numbers. In this article, I am not going to spill the beans by providing the actual numerical results. The table above, for example, is not the LTV from any one DoubleClick cataloger, but sample numbers that are actually quite realistic (in terms of the retention rate, number of orders, catalogs sent, etc.) What I can do, however, is to show you how the LTV is used to make some very powerful marketing decisions. · Sale item buyers versus regular price items buyers. · Web buyers, phone buyers, retail buyers, and multi-channel buyers. What kind of marketing decisions come out of LTV projects? These are typical but not universal results. In our research, some catalogs performed quite differently. In one catalog, for example, there was no difference in the LTV of peak season and off peak season buyers. In others, web buyers do not necessarily have a higher LTV. Web LTV results usually depend on the sophistication of the web site. Cross sales with live operators can beat a web site without automatic cross sale recommendations. Tracking referred customers requires a database system that keeps track of their source. There have been amazing results from such LTV exercises in the past. When Sears Canada for the first time built a database that combined both retail and catalog customers they learned that the average catalog customer spent $492 dollars per year. The average retail customer spent $1,102 dollars per year. What surprised them was that cross shoppers who used both channels were spending $1,883 per year with Sears. The finding led to a reorganization of the corporate management and the store layouts in 130 stores. They put the catalog desk in the most traveled entrance to each store, and provided catalog phones on the wall of every department with laminated catalog pages to help retail customers find what they wanted in the catalog if they could not find the item in the retail store. This shift alone led to increased sales of more than $250 million in the first year. Catalogers are rapidly realizing the value of having a customer marketing database, and using it to launch profitable research and operational programs such as lifetime value analysis.